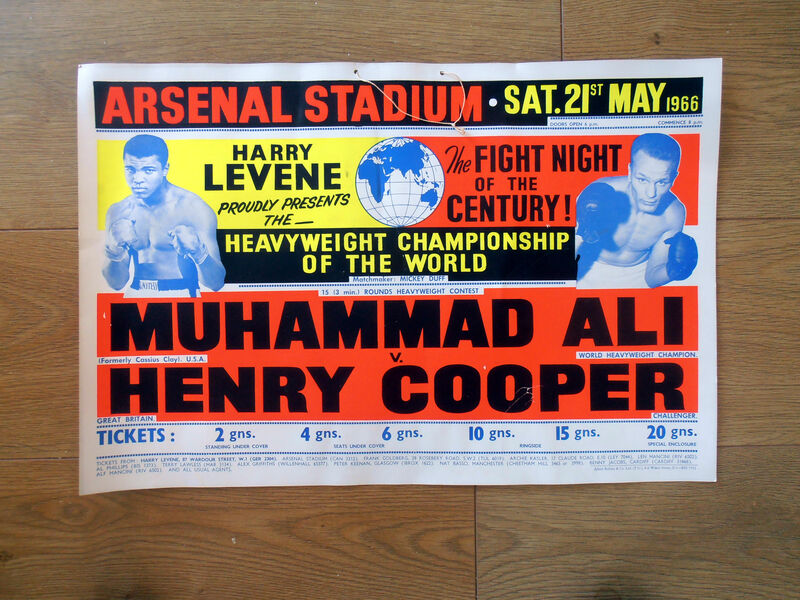 Description : Here we have an original vintage onsite boxing fight poster from Arsenal Football Stadium, Highbury, London, United Kingdom for the world heavyweight championship title bout, 21st May 1966. 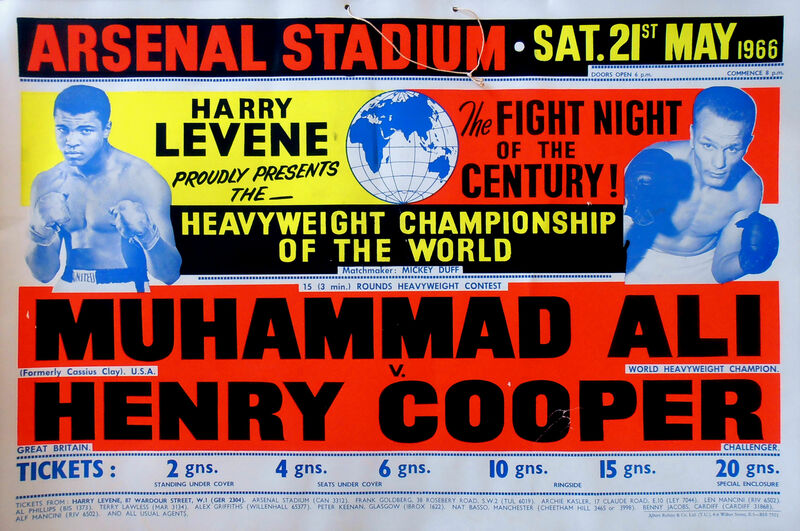 46,000 fans were in attendance in the open air for England's first world heavyweight title fight in 58 years to witness brave Englishman Henry Cooper lose to the reigning & defending champion, the former Cassius Clay, now known as Muhammad Ali by TKO at 1:38 in round 6 of 15 due to horrendous cuts around the left eye. The Associated Pres scored the first two rounds for Cooper, called the third even, and gave Ali the fourth and fifth. 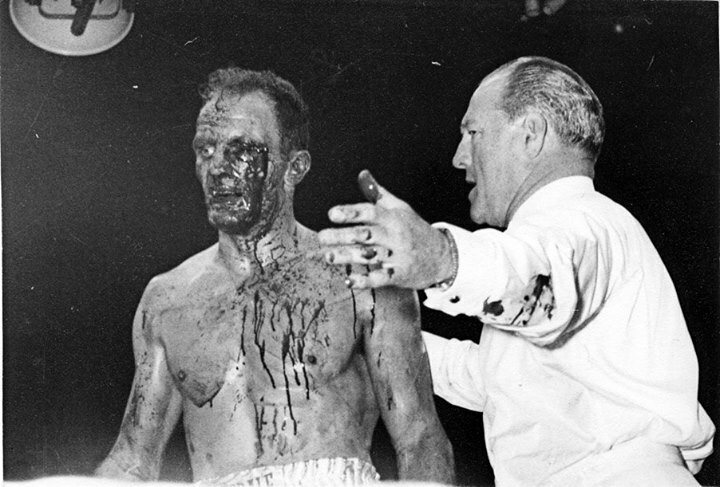 The fight was stopped due to a cut over Cooper's left eye, which Ali opened early in the sixth round. The cut required 16 stitches. Sports Illustrated reported that Ali landed "a short, chopping right hand onto Cooper's left brow. The blood shot out at once. Cooper did not merely bleed, he gushed. The cut opened above and slightly to the side of the brow, near the small artery at the temple, and both fighters were immediately splashed with blood." Cooper claimed the cut was opened by an accidental clash of heads. Condition : Good for age, minor handling*some surface creases*one of the best examples i've come across by way of condition for a vintage poster.